Rustic is one of those words that describes everything from farmhouse decor, handmade to Mediterranean. It does not have to be a cabin in the woods to be rustic. The style has evolved and nowadays applies to many different home improvement decoration products. Undoubtedly, you can use perfect rustic products anywhere around the house. It means rough, imperfect and casual. It's definitely a very broad term but there are several elements you need to have for something to be called that way. First of all, it has to contain natural materials in form of unfinished wood, stone, rough metals. The design is simple and has an earthy feel about it. Raw materials are also very common for Rustica veranda home decoration products, so rather than finding a sleek, polish wood, you should use more reclaimed and unfinished iron and stones. The other must-be component is that whatever rustic home decor you incorporate, your decoration products and furniture should be all hand-made so even if you do not have a farmhouse in the woods, you can still transform your urban loft into a vintage paradise by adding some unique materials. 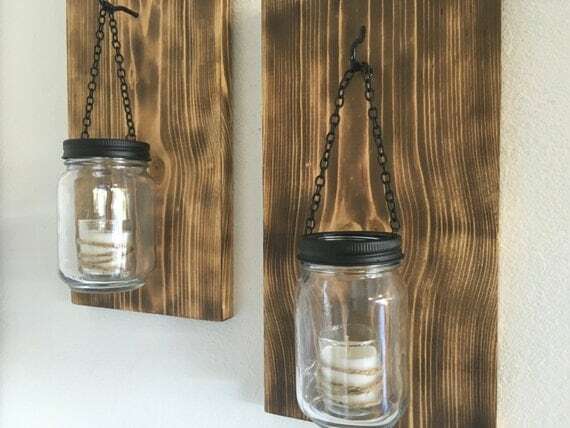 Two handmade wood boards varnished colonial dark with metal hooks holding on black iron chains glass jars with candles inside (see photo). The main idea for creating stunning rustic decoration products are to keep it simple and using organic elements in their natural state. The more these segments appear to be, the easier it is to keep a cohesive contemporary rustic throughout the entire space. Just look for decorative objects that embrace nature with textures, and colors that will add a lot of earthy warmth to your house. Choose cozy, easy and comfortable elements such as big dining tables and sofas, metal pendent lights and if you are lucky enough, a big fireplace that could be your statement piece in the living room. Search our site for over-sized appliances and furnishings. Consider Rustica superb copper kitchen hoods for instance. The color of copper is personification of the style. As for the colors, white walls give an excellent background for you to work with antique home products. They are bright, cheerful, and incredibly versatile in helping to create a fresh rustic decoration products feeling. If you are decorating a bathroom, try to add folk-inspired pieces of iron decoration products, vintage mirror, a retro copper bathtub with clawfoot base that you can also find within our offer and beautiful hand-painted tiles. You want each element in rustic home decoration to contribute to the overall effect, so consider placing a free-standing double slipper tub in the middle of your bedroom finished with a rough looking patina that will add a retro appeal to the design. Continue with some warm colors with woven baskets or rugs and textiles, perhaps bought on a local market. Don’t be afraid to add some vintage pieces and hand-crafted unique decoration products to any area of your home. They will just highlight even more your chosen style. Last but not least, you do not have to go full handcrafted to get that raw vibe. Rustic home decoration products for entry can be incorporated into any design style, as long as it is well-measured so you might consider adding to modern designs as an accent element products that will surprise all of your guests.